Flaming Fire - "Get Old And Die With Flaming Fire"
Flaming Fire are a very strange bunch. End of review. Nah... just kiddin. This is actually a really fun album. The band play what I suppose I'll call songs, but the overall glom reminds me of a mixture of The Residents, Frank Pahl/Only A Mother, and Devo, with healthy doses of tribalism thrown in. Based in Brooklyn, New York, the group consists of Theo Edmands on guitar, bass, and vocals, Rock "Banjo Pete" Leonard on vocals, oration, and percussion, Lauren Weinstein on vocals, Kate Hambrecht on vocals, and Patrick Hambrecht on guitars, sounds, and vocals. The zaniness starts with "Rabbit Run To The River" which immediately kicked in the Only A Mother/Residents comparisons, and is embellished nicely by chanting and freaky loops. "The Sun Is A Snake" is another Residential track that includes a guest appearance by what must be Arthur Brown's God of hellfire. "Disco Of Souls" is a Devo-ish techno dancey freakout with strange chants and fun oddball harmonies. "Pedophiliac" and "Whiskey River" are both interesting loop dominated tunes. "La La La" is like an artsy surreal tribal ceremony. "In The Summertime When Everything Is Holy" is one of my favorite tracks, being a bouncy tune that seems to be a cross between New Wave and 60's bubblegum. But of course that's too simple a description for these folks. There are also bits of psychedelic guitar and lots of quirky gear shifting that keeps things riotously fun. And speaking of fun, "Word Up!" is a bizarre glom of tribal chants, spaced out weirdness, and Rockabilly. And "Listen To Fluorescent Lights" struck me as an avant-garde electronic noise piece performed as part of a high school musical. The Thespian group at my high school was never that artsy. Finally, there's a 20 minute untitled track that starts off with real promise. Quirky dancey New Wavey silly surreal avant-theatrical. It's all here... Devo, the B52's, Killing Joke... very hard to describe but suffice it to say that Flaming Fire have got to be enjoying themselves. But then... ooooooh I HATE this!... there's a full ten minutes of silence. Bands are NOT being clever when they do this! So after the completely unnecessary silence the band returns and finishes up with a series of electronic experimentations and whimsical minimalism. Interesting... some good ideas... but ultimately not nearly as strong as the "regular" set of tracks. 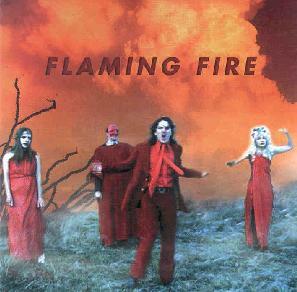 Flaming Fire do better when they include their wild vocals. Still, if my earlier descriptions aroused your curiosity then you're likely to enjoy Flaming Fire because they really can do some fun surreal songs. For more information you can visit the Flaming Fire web site at: http://www.FlamingFire.com. Contact via snail mail c/o Flaming Fire Music; PMB 112; 302 Beford Ave; Brooklyn, NY 11211.